So what does the Deakins on Mountainview’s Environmental Farm Plan look like? Our action plan addresses 5 areas of the Agricultural Policy Framework. Specifically, we have prevented livestock damage to our maple sugar bush by denying them access with the installation of electric fencing. We have introduced bird nest boxes and a birdbath to attract more native birds to our property, a measure which has attracted a nesting pair of bluebirds this year for the first time in 7 years. Tree planting near the house has been underway for several years to provide a windbreak. We continue to test our water rigorously for the increased protection of our B & B guests. But our commitment to environmental stewardship extends beyond the parameters of the EFP mandate. Our vegetables and other crops are grown organically. Our maple syrup products are produced in accordance with the Ontario Maple Syrup Producers Association’s Best Practices guidelines. 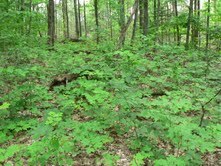 Our forest is managed under the auspices of the Ontario Managed Forest program that requires us to file a plan periodically and to log our forest activities on a yearly basis. 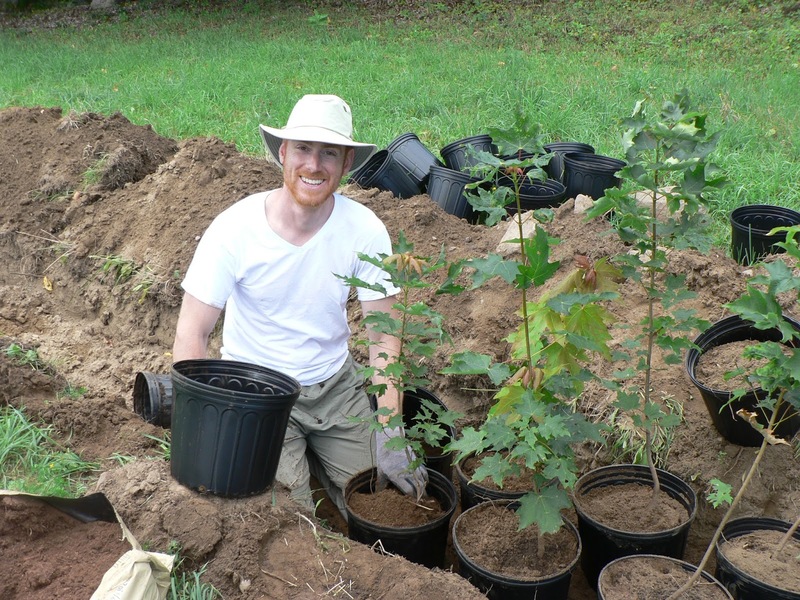 Our most ambitious project has been the restoration of our 75-acre maple forest. Since 2008 selective logging has opened up the forest canopy to allow for natural regeneration of sugar maples. Early results are favourable as several acres of the forest are now dotted with thriving saplings. 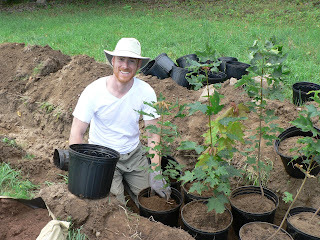 Additionally, we have planted tracts of open forest space with zone-hardy maple whips from a local tree nursery. These mini plantations are also becoming established. In an effort to maintain the genetic integrity of our maples we are also harvesting seedlings from our forest and growing them near the house in nursery conditions. In a few years these young trees will be reintroduced into the forest having enjoyed the advantages of water, nutrition, pruning, and a competition-free location. We use appropriate and humane deterrents to dissuade wildlife from damaging our maple trees. For instance, we painstakingly tie strips of Bounce fabric softener to all our young maple transplants several times per year. The scent has proven effective in protecting trees from browsing deer who particularly like to feed on dormant leaf buds in winter. This practice continues until trees have grown tall enough to be above the deer’s browse line. Beaver and porcupine populations are kept in check in accordance with the provisions of the Fish and Wildlife Conservation Act of Ontario. Nor do we miss an opportunity to educate our visitors about practicing a healthy respect for our environment. Last year we conducted 30 forest tours with our Bed and Breakfast guests alone. We also work closely with local schools to provide students with opportunities to learn about and to appreciate the wildlife and plant life that is their Ontario treasure. 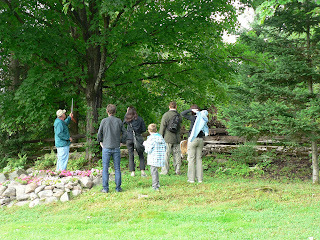 We also share our wild apple orchard with the deer, a bear - and our guests! 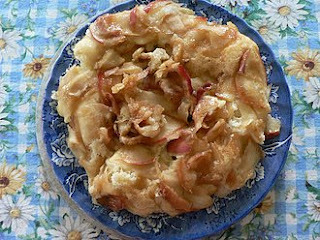 Mary Helen makes simply the best wild apple pancakes! Come visit us when you can … and see and taste for yourselves. What is an Environmental Farm Plan? In response to one of our facebook posts a reader asked, "What is the Environmental Farm Plan? Our answer comes in two parts - first, a general explanation (a backgrounder) and second a discussion of the measures we employ at The Deakins on Mountainview Bed and Breakfast and on our farm to protect and enhance our environment. The Environmental Farm Plan program (EFP) is a farmer driven initiative supported through Agri-Food Canada and the Ontario Ministry of Agriculture. The major focal points - soil, water, air, biodiversity and adherence to legislation - reflect the priorities of the Agricultural Policy Framework joint initiative of the Ontario and federal governments. The impetus for the Environmental Farm Plan program has its roots in the early 1980’s. At that time the transition from farming for subsistence to farming for business was being fully realized . ‘New’ farmers were now working hundreds if not thousands of acres and specializing in raising vast numbers of livestock. Almost immediately, the new mega farms were faced with substantial environmental challenges. Here are a few examples illustrating the emerging reality of the time. Runoff from large stores of manure was contaminating waterways and farm wells. Cattle grazing in farms' hardwood forests were compacting the soil to the extent that seeds were not able to pierce through the compacted soil and consequently many tree species were not regenerating. Biosecurity was threatened as visitors from other farms carried contamination, sometimes with devastating consequences. In some cases even veterinarians and drivers collecting livestock for transport to stockyards and sales barns were unwittingly adding to the growing environmental crisis as they travelled from farm to farm. Within a short time the federal and provincial governments responded with necessary legislation and farmers themselves banded together to draw up personalized environmental plans for their farms. So how does an environmental farm plan work? Ontario farmers, for example, identify areas of focus for their farm from a list of 23 categories. Some of these include pesticide handling and storage, disposal of farm wastes, storage of petroleum products, livestock stocking rates in confinement areas, energy efficiency, soil management and so on. Farmers next conduct a self assessment of their farm, design a plan to address issues and have their plan reviewed and approved by a committee of their peers. The Ontario government provides funding on a cost-sharing basis to assist farmers with certain areas of the implementation of their plan. Plans are updated every five years. To date participation in the EFP program is voluntary. However government assistance to farmers is contingent upon their having an up-to-date and active plan. So what does the Deakins on Mountainview’s Environmental Farm Plan look like? Visit us TOMORROW for part two of our discussion. Was it really a banner year for maple syrup production? 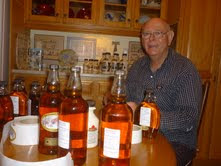 Surprisingly, 2013 at the Deakins sugar bush was a banner year for maple syrup production. In one run 180 two gallon buckets produced 324 gallons of sap with sugar content measuring 3.3%. In another run sugar content reached a hitherto unheard of 3.9% (2.4% being the average). I say surprisingly because, according to some, this was supposed to be the year that wasn’t. Experts explained that customary tapping practices may put Ontario’s maple trees at risk. Ordinarily, maple trees give up about 4% – 7% of their sap during maple syrup time. While trees may produce the same amount of sap as in years past, that amount, unlike in other years, may represent 25% of trees’ (especially young trees) total reserve. This fact along with the extensive winter damage of young trees by feeding deer and the uncharacteristically early fall drop of maple leaves is causing maple syrup farmers to hope and pray for good growing weather this spring to ensure the recovery of sugar maple stocks. Having done my part by limiting my tapping practices this spring, I’m banking on nature’s resilience and praying that our banner year hasn’t come at a high cost. In the short term at least, our guests will continue to enjoy high quality syrup at breakfast and still be able to take home souvenir packages. Perhaps there is no topic more appropriate for our first ever blog than to answer for our readers the question we’ve been asked umpteen times since we opened our first B and B in 1993 - Whatever prompted you to operate a B and B? Even now, as I broach the topic, I see the myriad of expressions on your faces as you posed that question – incredulity, curiosity, expectancy, admiration, and yes, do I detect even pity? Our desire to run a B and B stems largely, I imagine, from the delightful encounters we’ve experienced with B and B owners in our travels all over the world. One of my favourite memories is of a two-day farm stay just outside of Hamilton New Zealand in 2000. When the owners discovered that we were considering (the kind of consideration that falls in the category of wild fantasy) overwintering in New Zealand, they invited us to dinner and also their neighbours, Canadians who had themselves just recently moved to the north island and were doing precisely what we were proposing to do. Our evening ended perfectly when the owner graciously accepted Mary Helen’s offer to decorate their Christmas tree. I wasn’t at all surprised recently when I googled Carmel Farms only to find that Barbara and Leo Anselmi after these many years are still welcoming travellers to their farm near Te Kuiti, New Zealand. To some extent I think that running a B and B initially satisfied Mary Helen’s desire for familial intimacy – the sort you experience when all the rabbits in the neighbourhood come to afternoon tea. You may laugh at the comparison, but I think there is truth in it. There is something quite personal and delicious and satisfying about sharing who you are with strangers from half way around the world even if it’s only for a day or two. Our travel experiences have taught us that we want to be an intricate part of our guests’ experiences when they stay with us. For this reason our bed and breakfast experience is engaging, immersive and as hands-on as possible. We seek to provide encounters, interactions and moments that will leave our travellers with lasting memories. And our commitment extends beyond our doors. Through our suggested itineraries we connect our experiential travellers to our special people, places and cultures in the region. In closing, let me ask our readers, Why do you chose to stay in B and B’s?